Florence + the Machine dropped a 15 minute bombshell to their fanbase, as well as the FF fanbase, earlier this week. It came in the form of this digital EP, "Songs from Final Fantasy XV." Note the beautiful minimalism of the cover artwork, the X and the V layered against one another, creating the shape of two spotlights shining down. I've always seen Final Fantasy as a beautiful and creative game so I don't think I could have worked with another video game. It wouldn't have made sense. 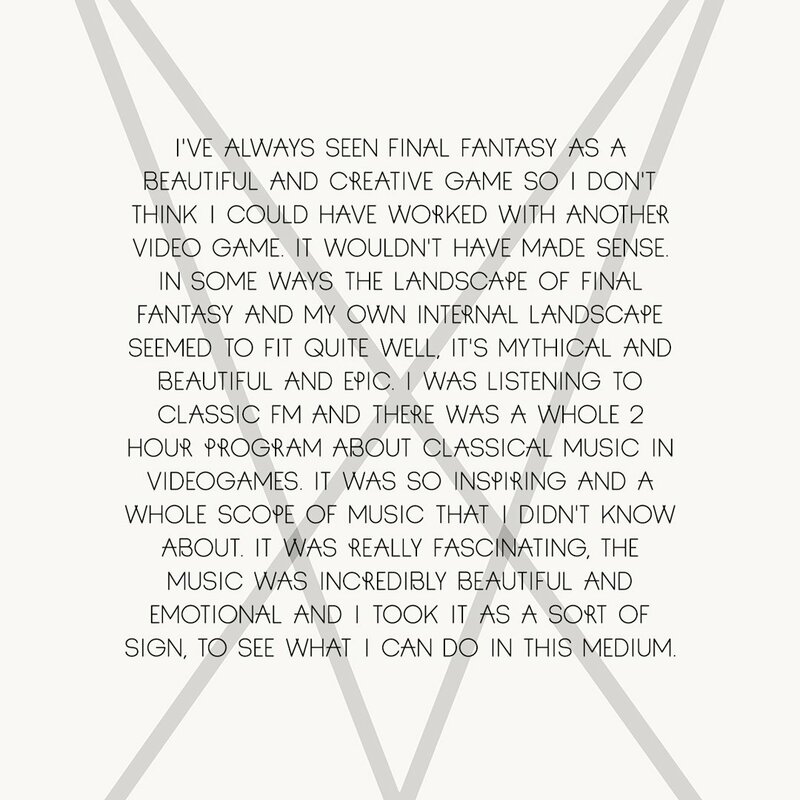 In some ways the landscape of Final Fantasy and my own internal landscape seemed to fit quite well, it's mythical and beautiful and epic. I was listening to Classic FM and there was a whole 2 hour program about classical music in videogames. It was so inspiring and a whole scope of music that I didn't know about. It was really fascinating, the music was incredibly beautiful and emotional and I took it as a sort of sign, to see what I can do in this medium. Who decides, from where up high? / I couldn't say "I need more time." Oh, grant that I can stay the night / Or one more day inside this life. Who cares about the thing I did that night? / So what? Maybe Luna had it right. And who cares if I'm coming back alive? / So what? Least I have the strength to fight! Let there be no question: Florence sang, and quite possibly wrote, lyrics from the perspective of FFXV's protagonist, Noctis. Referencing the heroine, Luna, and speaking to the plight of the hero's situation... this is clearly a song not just from, but for, FFXV. Its production quality is also something to marvel at. Considering the song was co-written by pop-producers Emile Haynie and Jeff Bhasker, both of whom have collaborated with Lana Del Rey, Florence + the Machine, and many others, you might not expect this song to be able to carry an air of authentic grandiosity. You would be wrong, however. This five minute song is built to last, with plenty of new musical ideas adding to and reinforcing the main melodic and harmonic structures. I think this song will hold fans' attention far better than Leona Lewis or Angela Aki ever could. The second song... well, what is there to say? We've known about the "Stand By Me" cover since this trailer launched back in March. The full version is amazing, more amazing than what we hear in the trailer, because we are given full context. The trailer reveals the climactic portion of the song, but without the appropriate build and fall, we are missing out on the full experience. The Florence + the Machine arrangement of the Ben E. King classic holds true to almost every note, but the instrumentation is changed up, and the slight swing tempo of the original is removed for a far more stand-tall-and-stand-firm kind of sound: something more like an anthem and less like a mere love song. Finally, there is "I Will Be." There are lyrics to this song, but until somebody officially publishes them, I don't think any of us can discern them, because most of them are whispered spoken-word against Welch doing some beautiful non-verbal vocalizing. "I Will Be" seems to be a song devoted to the beauty of the world and of nature. It should come as no surprise, then, that this latest trailer released by Square Enix, demonstrating that FFXV is far more than a driving simulator, utilized "I Will Be" alongside images of the flora and fauna of FFXV. This is the kind of song one can lose oneself in, and quickly; Put it on repeat, and enjoy your trip to another world. With luck, in a relatively short time, that wondrous world will be Final Fantasy XV. There is precious little I have left to say. This is a merging of two worlds that I never thought would happen. My wife and I adore Florence Welch's voice, and I've adored Final Fantasy since I was six years old. This project isn't a one-off song (see all other FF vocal themes), nor was it licensed after-the-fact (see Leona Lewis in FFXIII English version). Florence + the Machine dedicated themselves to making music that fit the world of FFXV, and will likely fit Shimomura's OST nicely as well. This was, obviously, a day-one purchase for me. I hope you purchase this little EP as well, so you can enjoy the great music and support an artist that chose to join the relatively small ranks of (non-Japanese) popular musicians "stand[ing] by" games and gamers.